Low intermodulation design and optimized return band prevents high cable modem signals from affecting forward band transmission. Therefore, the GVS-2 series digital Splitter Is ideal for present and future multimedia applications. Vertical Port F connections with a Unique plating for unmatched corrosion resistance to withstand harsh environments. Question: When would I use a Vertical Port Splitter? 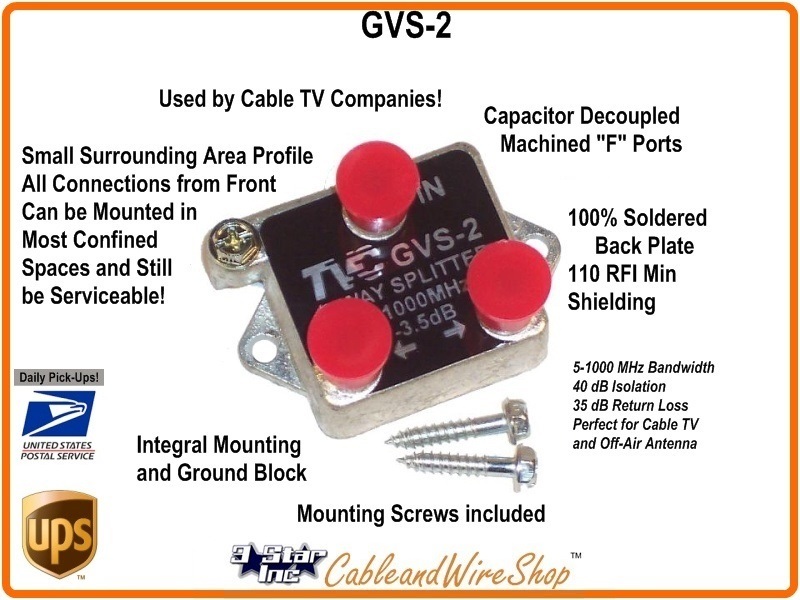 Answer: You can use this TVC Splitter placed inside a service box or mounted onto a surface where you don't have a lot of space surrounding the splitter for the wire and connectors. Cable TV companies use thesse types of splitters inside those lock-boxes you see on the side of Apartment Buildings.